With how fast business and technology are changing today, it’s challenging to understand what future growth and demand will do to your IT requirements. There’s one thing for sure, though: Your data center strategy and your company’s future are intertwined. Staying flexible and agile is the only way to adapt. ‍To continuously adapt and innovate, more companies today are opting for hybrid IT environments — and the trend is only increasing in speed. 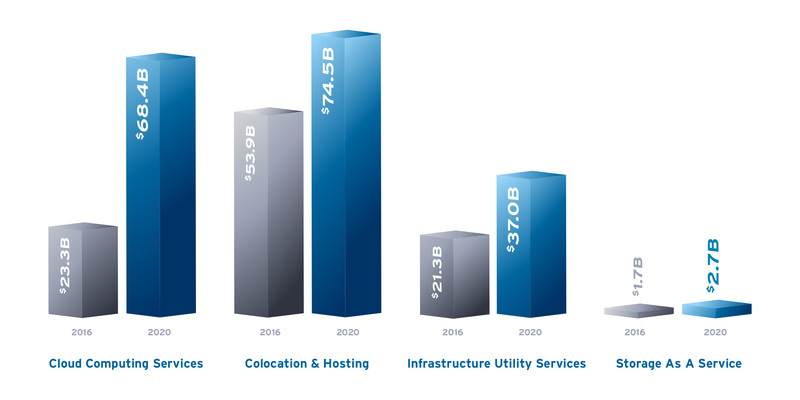 Gartner reports that cloud computing services are expected to reach $68.4 billion in 2020 (from $23.3 billion in 2016); spending on colocation and hosting will increase to $74.5 billion in 2020 (from $53.9 billion in 2016); infrastructure utility services (IUS) will grow to $37 billion in 2020 (from $21.3 billion in 2016); and storage as a service will hit $2.7 billion in 2020 (from $1.7 billion in 2016). Adapting your data center strategy for a hybrid IT environment is no longer an advanced move of the most innovative companies — it’s a prerequisite for success for any large or enterprise company today. While most executive leadership focuses on the flexibility and agility of internal processes and team structure, technology leaders know that a flexible and agile infrastructure is just as critical. Deloitte recently explored this issue in Rewriting the Rules for the Digital Age, noting that technology is changing at the most rapid pace, followed by individuals, and then by business and public policy. Today’s technology leader must chart a course balanced between business drivers and the advancing pace of technology. Hybrid IT is really as much about the business needs as it is about IT and cloud. It creates an environment that supports expansion and spurs more rapid innovation, but doesn’t and cannot ever come at the cost of stability for core business functions. Those that do this well will gain an advantage over their competition and those that do it poorly will struggle. Gartner predicts that by 2020, 90% of organizations will adopt hybrid infrastructure management capabilities. DD Mishra, research director at Gartner, remarks, “Organizations that adopt hybrid infrastructure will optimize costs and increase efficiency. However, it increases the complexity of selecting the right toolset to deliver end-to-end services in a multisourced environment." ‍Growth may be the thread that connects these three priorities. And technology leaders who keep their focus on growth are going to get and stay ahead of the curve. Higher growth rates have been found to predict sustained success — in fact, growth matters more to success than margin or cost structure according to a study from McKinsey. Supergrowers (companies greater than 60% two-year compound annual growth rate [CAGR] at the time they reached $100 million in sales during the study between 1980 and 2012) are three times more likely growers (CAGR between 20% and 60% at the $100 million mark) to grow from $100 million to $1 billion, and eight times more likely to do so than stallers (CAGR of less than 20% at the $100 million mark). Prelude: The company tests the fit between product and market, typically through one-off solutions for initial customers. Act one: The company narrows their focus to an offering that scales. Act two: The company expands the offer to new geographies or channels, extends the offer to a new product market, or transforms the offer into a platform. So how do you enable this growth while remaining fiscally responsible? You adapt your data center strategy for a hybrid IT environment. The smartest and savviest CIO and CTO’s use business requirements to narrow their hybrid IT decisions. Where is speed-of-change happening the fastest? These areas are your strongest use cases. Some areas of the business will experience faster cycles of change than others. It’s those areas that are struggling to keep pace with increasing and changing demands where hybrid IT can make the biggest, fastest and most lasting impact. Innovations such as Internet of Things (IoT), big data, machine learning, AI, and broader usage of mobile technology are also becoming key business drivers. Where can a hybrid IT approach offer more flexibility to adapt to innovation in your company? Keep in mind, too, that hybrid IT doesn’t just mean shifting to a mix of private and public cloud — it means using your existing investments while extending your infrastructure strategically. Are there areas of the business that could benefit from expansion of IT resources versus a straight change from one technology to another? To achieve your technology objectives effectively, your data center strategy must align with IT needs. You’re not just blending infrastructure, you’re blending administration, operations, and business aspects as well. How do existing IT systems integrate with new cloud services? Consider how different systems rely on one another and how they will react to changes and disruptions. How much redundancy and resiliency do you want and need? If two systems can’t ever lose connection, then design a more robust network, determine what data needs to be replicated, or group those systems together. Making a change to your data center strategy is a risk — but no more so than remaining in a rigid IT environment that can’t adapt to your business. Like with any major business decision, factoring in risk ahead of time can save you and your organization a lot of headaches down the road. Why are you considering the change? What is the risk of moving an asset? Are there security and compliance issues that need to be factored in? Will support be affected if you move the asset? What is the vendor's liability for a disaster and downtime? What is the timeline and road map for migration? How should you group and test changes or new deployments? Now, what is your organization’s risk tolerance? This isn’t an easy question for most technology leaders to answer — but it’s still crucial to address. This assessment will help you prioritize what technology to house where. For example, if you have a tool that gathers and retains the personal and financial information of customers, you’ll know to opt for a highly secure, dedicated infrastructure solution which is private. Note: Having your security team in the room for these discussions isn’t negotiable. Companies that treat security as an afterthought are often the first to have security problems. Though a data center strategy with a hybrid IT environment may involve multiple locations, vendors and teams, corporate governance is still your company’s responsibility. Unfortunately, many IT organizations are left without guidance or the right processes to manage a hybrid data center strategy. Standardizing the governance framework might not be the most romantic aspect of a data center strategy, but it’s one of the most important aspects by far. Before you make any changes, make sure your approach to corporate governance reflects a hybrid model and is easy enough for managers at all levels to understand and use. The best thing you can do is design the governance system purposefully and proactively. Organizations that neglect this often end up with lines of business — rather than IT — making the decisions. This is risky at best because IT organizations still remain responsible for ensuring services are consistently available, secure, and comply with regulations. IT principles: The high-level decisions about the strategic role of IT in the business. IT architecture: An integrated set of technical choices to guide the organization in satisfying business needs. IT infrastructure: The centrally coordinated, shared IT services that provide the foundation for the enterprise’s IT capability. Business application needs: The business requirements for purchased or internally developed IT applications. Prioritization and investment decisions: How much and where to invest in IT. Is your governance framework as simple as this? If not, consider adapting these domains for your company to design a governance system that works with a hybrid IT strategy. Determine which teams should be responsible for which decision domains in your company. Third-party services and applications must be assessed side-by-side with internal services and applications. Your IT organization and your company need one overall governance framework to refer to, with clear owners for each element or domain. There are so many upsides to a hybrid IT environment, it’s easy to want to gloss over the downsides. One downside that must be considered, however, is that the more data center locations and services you have, the more your data is spread out — and the more opportunity there is for security concerns to arise. Even with the most thorough planning around security, risk remains. So what happens if there is a security breach? (Or rather when there is a security breach? No company is immune.) Plans for disaster recovery and business continuity are two more things you should be assessing and building in advance of migrating to hybrid IT environments. You might not know exactly how your business is going to change in the next 5-10 years, but with hybrid IT you can create a technology environment that can adapt to almost anything that comes along. With advanced planning, that agile, flexible strategy can also be streamlined and secure while serving business needs and keeping IT in its rightful position of technology leadership.